Simon - "Writing on the Cosmic Wheel"
Alright, what we've got here is a group of teenage kids from the east suburbs of Pittsburgh, PA thinking that maybe it'd be cool to form a band and be a bit more popular around high school, ok? So no chance then that Simon's music could actually be interesting to someone like myself who's twice their age, right? Especially when the music is heavily grounded in (gasp) hip-hopdom! Well, somewhere along the line, these precocious youngsters must've been poisoned by exposure to some cool space rock, because "Cosmic Wheel" is truly cosmic. It's about as new and different as spacerock (?) can get...and more than that, it's actually quite professional...and best of all, it's actually very enjoyable music. The album starts out with the requisite countdown to take-off (10...9...8...etc. )...ok, so far, so good. But then the opening track 'Oxygen' kicks in with its deliberate hip-hop beat and obligatory 'clap snare' (for lack of a better term), and I immediately wonder if this CD is mispressed with the latest Boyz II Men offering. But then I hear the lyrics, "Oxygen, a substance we all need," so I guess not. My initial reaction is one of confusion as I thought I'd purchased a space rock CD, although I did note some cosmic-sounding light guitar work on this track. 'Zones of Loneliness' then chimes in with nearly the same hip-hop beat (uh oh! ), but then some of the coolest bubbly guitar lines start up, and we're soon off to distant galaxies at warp speed! That sort of basic formula is repeated (with various space:hip-hop ratios) a total of twelve times, with over half of them coming through as real winners. In a single listen, I'd become a big fan of both Matt Tomayko's spacey guitar work (sounding like a Roye Albrighton protégé) and Paul Luc's intoxicating voice. OK, the rhythm section (Abe Nehrer on bass, and Sal Pennachio on drums) doesn't quite win me over exactly, but then again, they're the ones responsible for making this music (let's call it 'space-hop') so different. 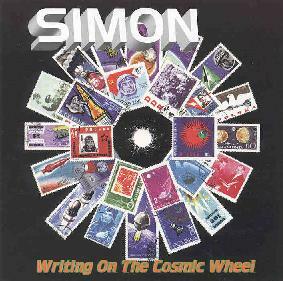 Here and there, Simon also incorporate some other stylings into selections from "Cosmic Wheel." 'Violet' is 90's style reggae, with a taste of scratching a la Herbie Hancock. 'A Bit Strange' sounds for all the world like one of those Mallorca-penned ditties by Gong's Daevid Allen (especially with the glissando guitar), though here it seems as though the vocals were done by...I dunno, help me out here...Coolio? Puff Daddy? The finale, 'In the Sky,' is the most ambient track, with synthesizer taking over the lead melody duty. My favorite track, though, is 'Superstition,' another simple and deliberate rhythm, but the fabulous guitar leads and wonderful drifting melodies carry this tune to great heights. Making good music is easy no matter what 'formula' you use as long as you write good songs, and Simon composes music that belies their few years (well, maybe the lyrics aren't quite so deep). The result is that these kids have made 'space-hop' a reality and so if you're daring enough to try something really new, then get yourself a copy. You can visit Simon at their web site.